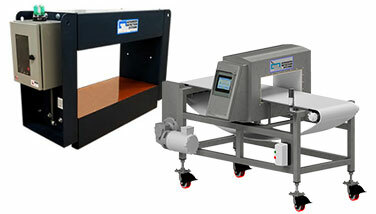 Validating the performance of your metal detector is critical to conforming to safety standards and HACCP plans. Whether you have an Advanced Detection Systems metal detector or another model, our team of knowledgeable service technicians can thoroughly inspect your system and either confirm that everything is running properly, or indicate any problems. You will receive a certification document along with a permanent label to place on the machine to indicate the inspection date with a reminder of when the next inspection is due. 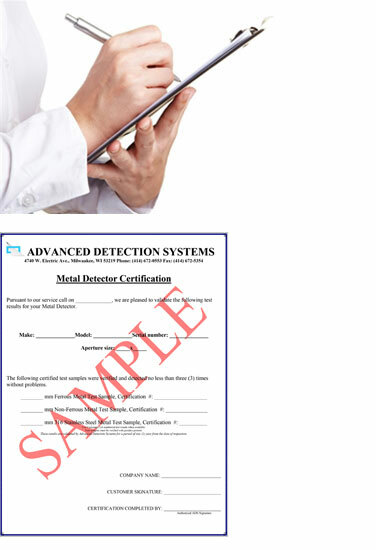 We can certify any make or model metal detector! 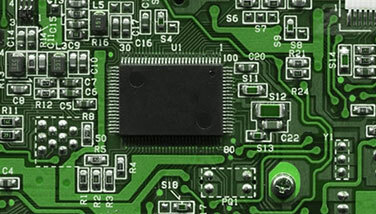 Certification Services available by Certified Advanced Detection Systems Local Representatives. Are you facing, or have you recieved a reduced audit score because of metal detection deficiencies? Contact Advanced Detection Systems today for expert advice on developing, implementing, or revising your HAACP policy to satisfy an audit requirement. Click on the links below to download PDF documents pertaining to metal detection from governmental and food safety organizations. Excerpted from the US Food and Drug Administration Food Safety Booklet. Safety Quality Food Institute - A HAACP Based Supplier Assurance Code for Food Safety. Excerpted from F037A BRC Global Self Assessment Tool for Food Safety, Issue 7.2. 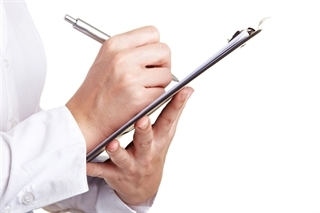 Complete document pertaining to all aspects of BRC compliance for food safety programs. All of these links will take you to a new window. Advanced Detection Systems is not responsible for the contents of the links posted on these agencies' respective sites. Below are the services we offer and can be customized to fit your specific needs. 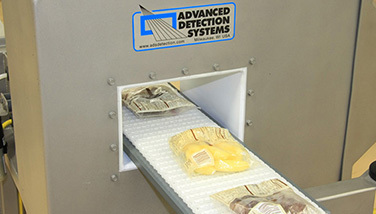 For more than 30 years, Advanced Detection Systems has been a robust and reliable leader in providing metal detection systems in the food processing and packaging industries as well as aggregate, mining and recycling applications.